Based on the outskirts of Quimper, this beautiful site occupies the grounds of a 17th-century manor by the banks of the River Odet. Converted outbuildings serve as the restaurant and bar, while the surrounding grounds offer some lovely walks. Keen golfers will appreciate the nine-hole course, driving range and training bunker, while the Odet provides some peaceful spots to fish. 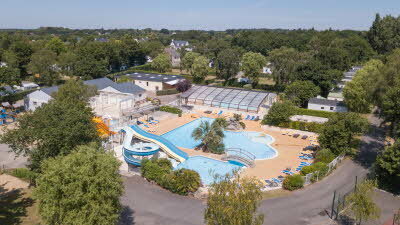 Children will also find plenty to do, with a huge pool complex, mini-golf and kids’ clubs to enjoy. 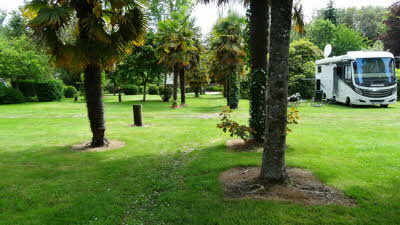 Quimper is within walking distance of the site and has a stunning Gothic cathedral and 14th-century old town. Stop at the Place du Beurre for a crêpe or admire the local art at the Musée des Beaux Arts. The sandy beaches and rocky coves at Bénodet are also close by; visit Saint-Gilles beach for a sport of rock pooling. 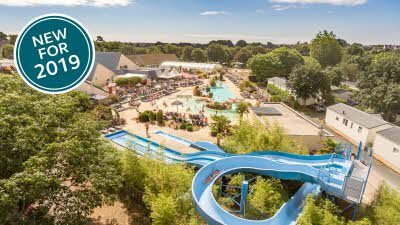 Iles de Glénan, Armorique National Park, Pointe du Raz, Concarneau, Quimper, Locronan, Indoor swimming, Forest adventure (Bonobo Park), Golf, Horse riding, Hiking, Walking trails, Cycle routes, Water sports. 1 1/2 miles south of Quimper. From the N165 take the exit for the D765 (SP Quimper –Centre/Pont L’Abbé) continue on the D365, D783A and the D34 following signs to Pont L’Abbé for approx 4.3miles/7km, Then take right exit (SP Prat Marina and Lanniron). Continue for 420 meters then turn left (site is signposted), pass under the D34 and take the 2nd road on the right. We stayed in May this year but there was some minor issues. The facilities were not cleaned daily and when we were there they had wedding on, consequently the men's facilities was closed and they had to use the ladies. The swimming pool wasn't open, the shop wasn't open and the restaurant/bar seemed to only open when somebody could be bothered to open it !! The site is in an excellent position and setting. It has fantastic facility's when available !! ok the pitches are slightly overgrown but they were large and did have easy access. Arriving at the end of September we found all but the most basic facilities were closed (which we expected), which makes this site quite expensive for what you get. There were not many occupied pitches, but as one toilet block was closed most people were pitched together at one end of the site. Unlike previous reviewers we didn't find the place untidy or excessively overgrown - who wants hedges trimmed like a show garden anyway?.The toilet and dishwashing facilities were kept clean, despite bad weather causing some mud to be trampled in - this was inevitable, but the cleaner did a good job. The reception is some distance from the site, but that's not too much of a nuisance. More of a nuisance is that to use the foot and cycle path into Quimper you have to go all the way back past reception to enter the path and then double back. Any direct access from the site is fenced off, presumably for security reasons, but it does add 10 minutes or so to the walk into town. 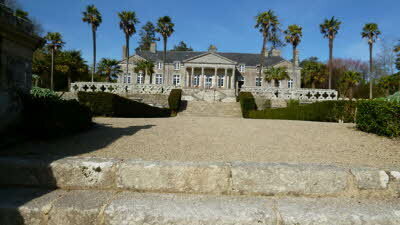 This is a good site if you want to visit Quimper, but would not go back otherwise. We obviously can't comment on the facilities for families in high season, but they appear to be good. Whilst many of the pitches are a good size, most are overgrown with low tree branches making access difficult and untidy hedging. At this time of year many of the pitches were littered with fallen and rotting apples - as were many of the pathways - clearly nobody had made any attempt to remove these for weeks! Both sanitary blocks are very tired and grubby and are not thoroughly cleaned on a daily basis - both are now beyond recovery with a deep clean and need revamping. The site generally feels un-loved and poorly maintained and it appears management are more interested in the golf course than the campsite as demonstrated by the fact that the campsite reception is shared with the golf reception and is completely isolated from the campsite itself! The site has open access with no on-site security. We won't be going back. We returned to the site for the third time having had a positive experience previously. 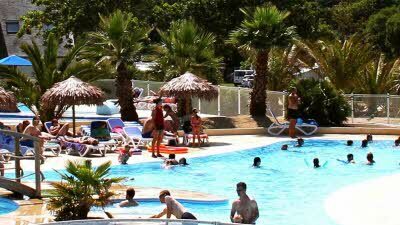 Developments included a new reception and excellent water park unfortunately these are now situation a ten to fifteen minute walk from the camping area. 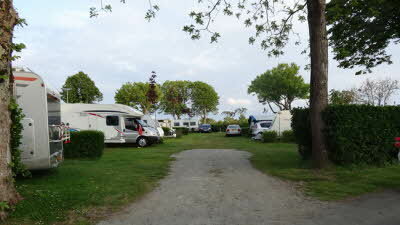 The facilities in the main campsite did not meet the advertised five star standard. The pitches while spacious were unkept. The toilet facilities were adequate but with minimal cleaning through the the four nights of our stay. Dishwashing areas were not cleaned nor the bins there emptied. The site also offers wedding facilities and on the Saturday night the music from the wedding continued till 5.45am. Concerns expression to reception about the cleaning of the toilets were not addressed and detritus from the wedding littering the floor of the men's toilets was not cleared up. We would not return and would not recommend the site to others. This is a site I so much want to write good things about. Quimper is a lovely city, the pitch we had was wide and spacious. 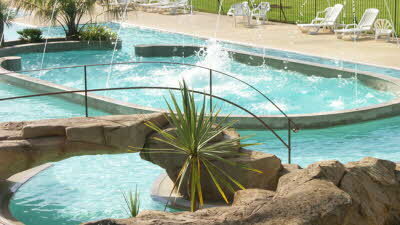 The staff were great and the pool/’aquapark’ was fun and interesting. All this was just what I have come to expect from a Castels site. However, the site fails on the most basic of issues. There are 2 sanitation blocks; one by the summer palace is modern, clean and more than acceptable. 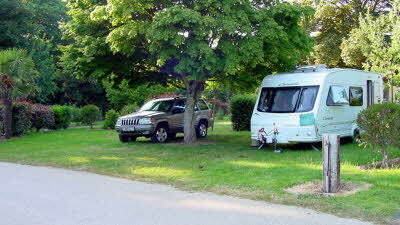 It is the other one in the centre of the campsite which fails so spectacularly. The block is very old and when we were there only the male side was open, enquiries at reception prompted an answer that ladies were to use the same facilities. Not a problem where it is set up to be unisex, however in this case – access to the toilets was by passing the gents urinals – not a satisfactory solution. So if you are a female visitor, make sure you pitch at the southern end of the site. I’d love to go back as there was more of Quimper to explore – but until the washing facilities are sorted – it won’t be here.